This week on my television segment Food 411/Come Dine with Me WNY, I’m at Woodcock Brothers Brewery and Restaurant! Nestled into the southern shore of Lake Ontario, sits the small town of Wilson, NY. Settled in 1818, Wilson holds some unique architecture, including the Morse Cobblestone Farmhouse. A beautiful L-Shaped home built in 1845, it mimics Neoclassical architecture which had been popular throughout the United States during the Civil War, and is now part of the National Registry of Historic Places. Due to its proximity and its location in Niagara County, the Civil War had a huge impact on the citizens of Wilson and throughout the Niagara region. It is said that a bugler in the Battery M regiment, a Prvt. Pratt of Wilson, captured a confederate war horse, rode it for the duration of the war, and brought it back to Wilson where it lived out the remainder of its days as a workhorse and true companion of Prvt. Pratt. Situated on a top a beautiful hill, Woodcock Brewery was the first in Niagara County to brew its beer on site and serve in-house. Not only is the location of this brewery somewhat unique, but the desig n features, showcasing the distillery at its center, are breathtaking. 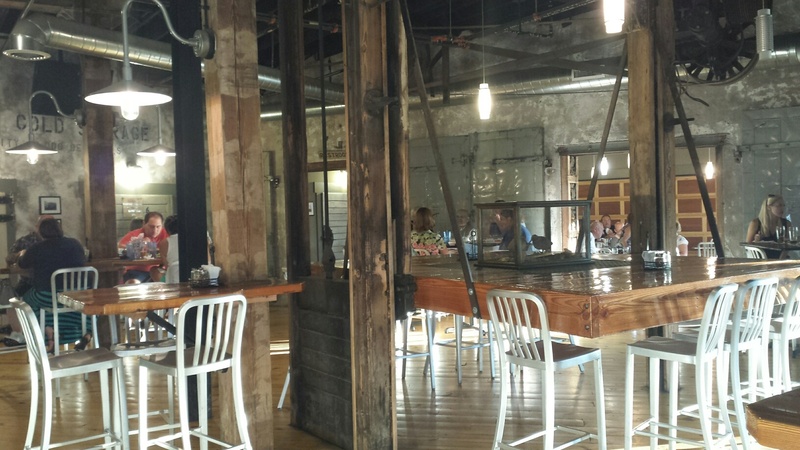 The rustic barn-like atmosphere melts together farm-style decor with industrial beams and pulleys. Vaulted ceilings and full length windows give it an open airy vibe so that even when packed with patrons you don’t feel crammed in. 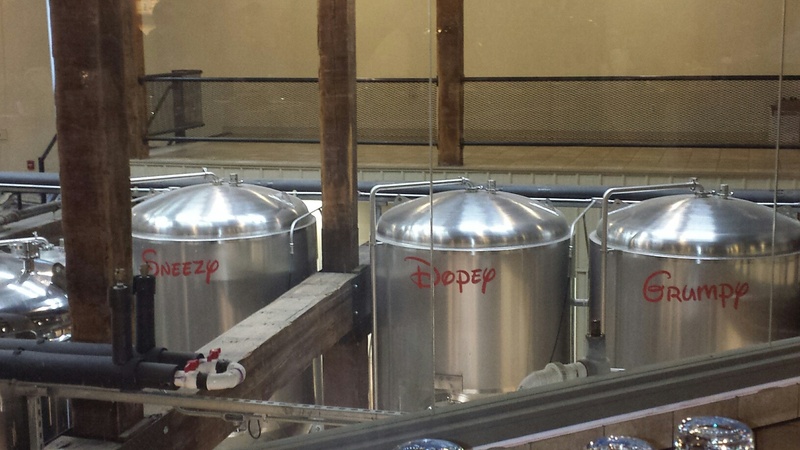 Pulling from one of my favorite fairy tales, each fermentation tank is named for one of the seven dwarfs and the bar wraps around the tanks, so that every patron has a perfect view of Dopey, Sneezy, Bashful, Grumpy, Sleepy, Happy, and Doc. 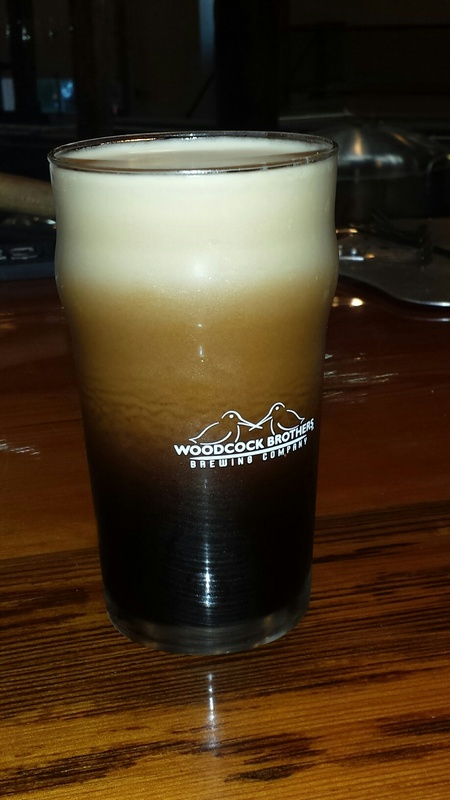 Outside of great beer, Woodcock is also known for exceptional food. While the menu is rather simple, Woodcock offers daily specials that are creative and tasty. The Spent Grain Pretzels ($8.00) are a house specialty made with malt, and pair great with a Porter which has its own roasted malt flavor combine with a hint of coffee and chocolate. Their in-house IPA has a very mild flavor to it; good round malt that is soft and lends just enough weight so that the ripe peach and herb notes are showcased. While there are burgers, wings and appetizers to choose from, the wood fired pizzas are the main attraction. On a previous visit, I had the Loaded Potato Pizza ($17.00); a thin crust homemade pizza with sliced potatoes, cheddar cheese, bacon and chives with blended oils. Shocked at how light and airy the crust was, I bit into this pizza and immediately noticed a similarity in taste to a traditional Irish Potato soup. The potatoes are sliced thin and scattered perfectly around the pizza, so that not one bite goes without. The bacon offers a salty smoked flavor without being overly greasy, and the chives give it a delicate onion flavor. On Food 411, the loaded mac-and-cheese is a popular menu item. This hardy dish is accentuated with big chunks of fresh chicken, and loaded with lots of sharp cheddar cheese, and thick pasta (elbows). It is served in a skillet. This dish is not for the faint of heart; it’s ooey, gooey but oh so good. Woodcock’s thin crust Margarita Pizza ($14.00) with mozzarella cheese, freshly grated Parmesan cheese, sliced tomatoes, fresh basil, and garlic is cooked to perfection. Using a brick pizza oven, the crust is made in-house. It’s not charred on the bottom like most brick oven pizzas, and even as a thin crust, the dough is soft and chewy. You have a choice of Lakefront Olive Oil or house-made “sweet” red sauce.